The human mind works in weird ways, especially when you are not paying attention to details or when you tend to do things subconsciously. Be it a hectic schedule of running errands, or a day when you’ve shopped till you dropped, the first thing you want to do was to head home and hit the hay before the scorching heat or the cold gets to you. Though, sometimes our luck does not work in our favour. After all the strenuous activity, we tend to set aside our keys while loading and organising the groceries into the back of our SUVs and without a second thought or presence of mind, we close the hatch. Shortly after, reality hits us and our hearts sink as we realise that our keys have been securely locked inside the vehicle. Trust us, this has happened to the best of us and this is a common situation that most of us find ourselves in at least once in our lifetime. When such a thing happens, normal human tendency is to immediately find a solution. With all the confidence that the “Do It Yourself” videos or the Wikihow pages on the Internet have given us, our reflex action would be to try and get into the vehicle on our own, not call a Perth locksmith as logic might dictate. As tempting as it may be, it comes with a fair share of drawbacks. The danger associated with breaking into your own car is simply not worth the risk in the long run. Though the solutions on the Internet look promising, the wise advice would be to get professional help from trained locksmiths. If you happen to find yourself in this situation someday while you are in or around Perth, you can contact Action Lock Service, expert locksmiths at Osborne Park, for a prompt and efficient service. 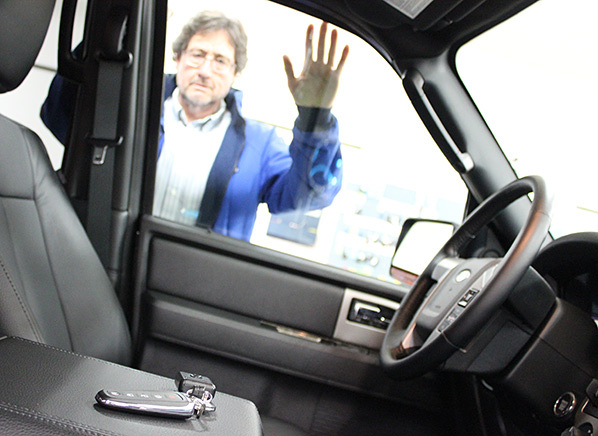 Why you should call a specialist Auto Locksmith. Avoid a brush with law enforcement: Most of the time when you are trying to break into your own car, it is highly likely that other concerned passers-by may not realise that you are the vehicle’s owner and alert the police. This will only add to your peril and cost you your precious time, as you calmly try to explain the entire scenario to the authorities and convince them that the locked vehicle belongs to you while your paperwork is still in the car. You could just call a car locksmith and evade the trouble altogether, saving you time and effort! Avoid dangerous situations: Not all of us are lucky enough to have parked in populated driveways or parking lots. Being stranded in isolated areas while trying to break into your own car only adds on to the chances of you becoming the target of lurking criminals who are ready to jump at any chance to extort you of your money and valuables as you are distracted with the unfamiliar and tedious task of breaking into your own car. You should ask yourself if it is worth the risk. It is better to be safe than sorry and call for professional help than to jeopardise yourself in such circumstances. Avoid damaging your vehicle: Breaking into the car on your own may seem like a more cost-efficient and viable option at that point of time but it is not worth the regret or the cost when you accidentally damage something while in the process, owing to the lack of knowledge about the technicalities of your vehicle. Whereas, an experienced car locksmith in Perth will not only make your job easier and faster as he will understand your vehicle and is also experienced with the task at hand, but he will also cut down on damages that you may have to pay in case you are to accidentally damage any part of your vehicle. Risk of hurting yourself: Adding to the fact that breaking into your own car is an unfamiliar task, there are high probabilities of not only damaging your vehicle but also hurting yourself in the process. The tools you need to use while following these go-to videos could require expertise when being utilised. Prying open the door might seem like an easy task, but it has to be done meticulously, and that is one aspect most of us will probably miss in our haste to get the car open. With the lack of experience, it only increases the likelihood of you hurting yourself and adding more stress to the situation. Save yourself the pain and contact a car locksmith! It is harder than it seems: The videos and tips on various pages on the Internet have a capacity for delusion. Vehicles that have been produced in the past two decades have been fitted with enhanced anti-theft technologies that leave no scope of breaking in. With each motor vehicle manufacturer trying to outdo the other, vehicles are fitted with different lock mechanisms which constantly change from time to time. A trick that you’ve found on the Internet that proved successful on a 90’s car might not suit your vehicle type or make. Thus, it is essential that you contact a professional who is well-versed with the knowledge necessary to navigate through the situation and get you into your vehicle no matter how new or old it is. The next time that you are faced with such an unfortunate situation, always consider the reasons listed above and keep away from breaking in to your own vehicle or trying to mend things on your own. Always weigh up the possible dangers, damages and the even extra costs you might incur by trying to break into your own car. Contact the nearest automobile locksmith and ensure your safety. If you’ve overcome the temptation of trying to break into your own car, you’ll need a reliable and trustworthy service to come and help. This is where Action Lock Service comes in. We are a widely renowned automotive locksmith company in Perth, with experience spanning over 25 years and a large number of happy clientele. Our expanding business and satisfied customers are enough proof of the quality of our service. Our mobile locksmith vans cover the entire Perth metropolitan area for all on-site work. 24/7 service: We care for your safety and wellbeing and understand the urgency of the situation, thus, we offer a mobile 24/7 emergency locksmith service in case of emergencies. Auto Key replacement: We offer multiple automotive locksmith key replacement and auto key repair services. In the case where you have lost your transponder key, we can help you produce you a matching key or else we can replace the proximity keys. Competitive prices: We offer one of the most competitive rates in the market. So you can rest assured that you’re not going to burn a hole in your pocket whilst getting out of this unlucky situation. Experience: In a business like this, experience speaks for itself. It is important to be well equipped and educated about vehicles. With our experience of 25 years, there’s not a problem we haven’t seen. We are ready to bail you out in any motor vehicle lock complication. Locksmith for all your home security needs: We offer a wide select of high-quality locks for residential properties across Perth to keep your homes safe and theft-free at any time of the day. Commercial locksmith: We tender to businesses which require any type of commercial locksmith work- access control systems, exit door services, real estate repairs, etc. on a large scale. Safes: We provide services such as safe supply, installation and repair for commercial and residential customers across Perth. For further information about our locksmith services, or for an emergency locksmith in Perth, give the local mobile locksmiths at Action Lock Service a call – 08 9240 7200 or you can simply visit our website- www.actionlock.com.au to find out more about our services. We offer a 24/7 emergency call out so you won’t get stuck locked out of your car, whether it’s day or night. This entry was posted in Auto Locksmith, Emergency Locksmith, Mobile Locksmith. Bookmark the permalink.